Ancient spiritual practices meet modern digital art in these kaleidoscopic journal covers featuring the work of Android Jones. 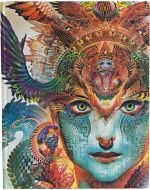 Dharma Dragon and Revolution ask the viewer to focus on the potential for awakening, the power of the ancient third eye and the early reverberations of the time that lies before us. With colours at once psychedelic and hyper- modern, and imagery that combines Eastern iconography and a cutting-edge science fiction æsthetic, Jones is an artist who draws on old traditions and those yet to be born. Jones calls himself a digital painter and is renowned for his multidimensional, spiritually driven art and performances and the expanded states of consciousness they evoke. Whether one fancies him a shaman of pop art or a practitioner of electro-minimalism, at the centre of his art is a sense of untapped potential and limitless imagination. 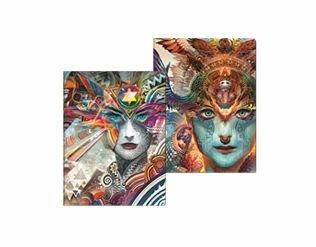 With these journals, we invite you to push the boundaries of perception and awaken to the possibilities of your own third eye.